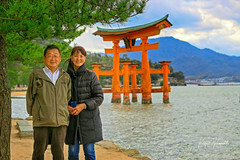 Uncle Yutaka and darling little Aunt Michie in Hiroshima. Circa 1918. Life in Hiroshima was uncertain and grueling in 1945 – especially for women and children. It is a fact that nearly all the men up to the age of 35 had been taken by the Japanese military. For many, it was truly day to day. Little food, clothing and medical care. It all went to the military…and then there were the B-29’s and the bombings. Devils associated with being on the losing side of war. But at 8:15 AM on August 6, 1945, my Aunt Michie’s already tough life would be cast into wretchedness to test her mortal soul. She was in her farm’s field clearing old crops on that hot summer morning. There was an intense flash of light then the atomic bomb’s shockwave traveling close to the speed of sound slammed into her. She was catapulted and hit the ground. At the same instant, her oldest daughter and my cousin Masako – who was eleven and in her classroom nearby – was hurled across the classroom by the same shockwave. The schoolgirls that were standing in front of her were pierced by shards of glass and debris. After years of a most grueling life, Aunt Michie and her children would now face the searing pain of surviving. Even while giving shaves at my Grandfather’s barbershop in Seattle, Grandma Kono was busy in her early years of marriage. She gave birth to Yutaka (1910), Hisao (1912) then Michie in 1914. 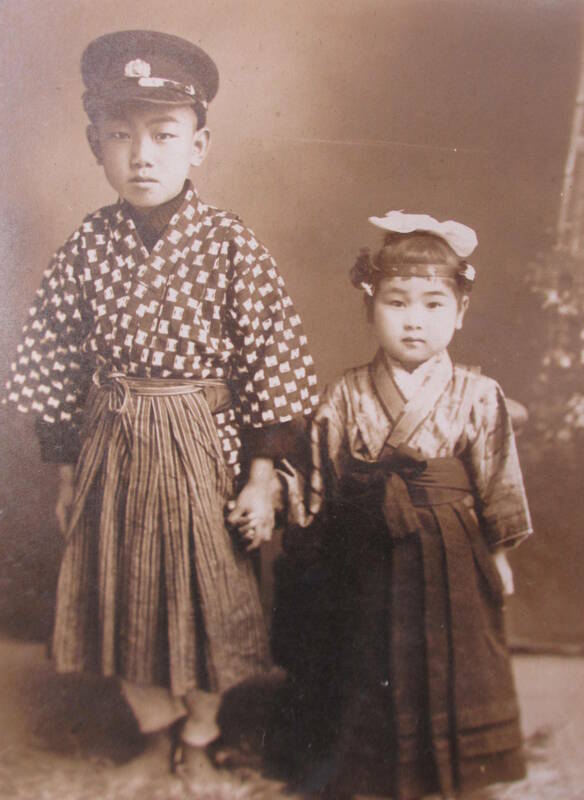 Other children followed: Shizue (1917), Dad (1919), Suetaro (c. 1921) and Mieko (c. 1924). A total of seven. 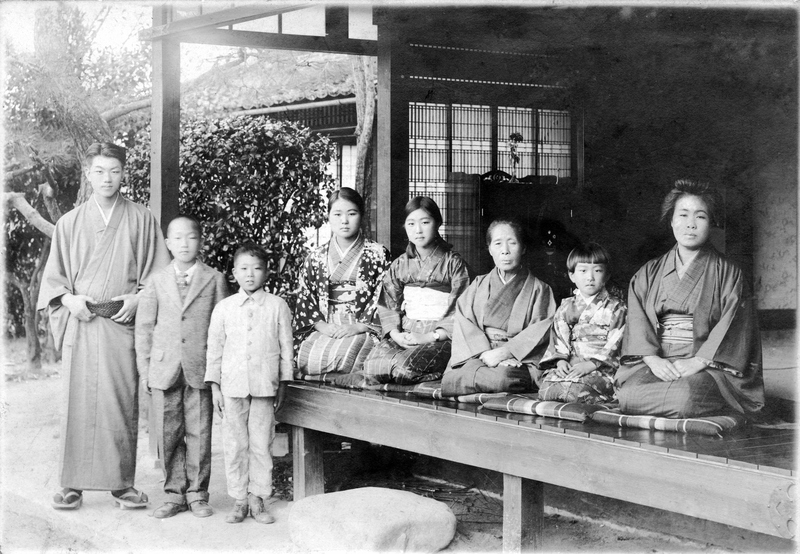 (L to R) Yutaka, Dad, Suetaro, MICHIE, Shizue, Great Grandmother Kame, Mieko and Grandmother Kono. Circa 1928, Hiroshima. All seven of the siblings were born in Seattle… All except for Michie who was born in Hiroshima. My cousins tell me their mother Michie told them she would wistfully ask her family, “Why couldn’t I have been born in America like everyone else? !” Lovingly, of course. Aunt Michie never did get a chance to visit America. Dad’s siblings came to Hiroshima and half of them were able to return to Seattle to continue their lives as Americans before war with America. But Michie lived her entire life in Japan. She was the oldest sister to the siblings and helped Grandma Kono raise them. Michie’s father (my Grandfather Hisakichi) was a devout Buddhist. He required the family to chant Buddhist mantras daily; it was not “praying” but a way through which a follower “energized” himself to the teachings of Buddha. Dad’s Hiroshima home to this day has the altar in the main room where they chanted; it is unchanged in nearly a hundred years having survived the shockwave from the atomic blast. 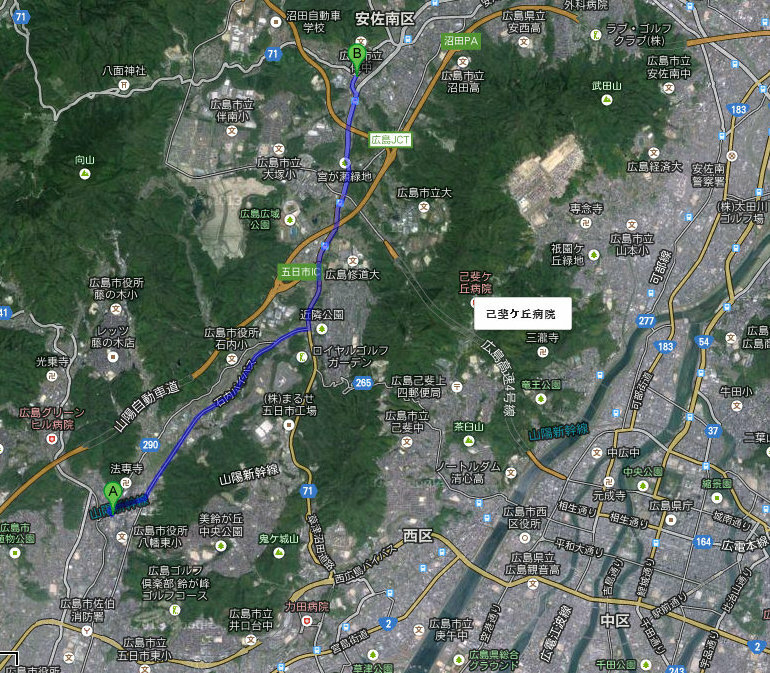 My father’s family home is at “A”; Aunt Michie’s home in the village of Tomo is at “B”. About five miles separates the two homes. The atomic bomb’s hypocenter is towards the bottom right where rivers split up. 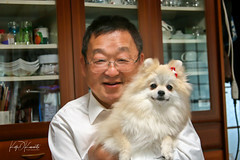 Being of farming heritage, Mikizo had acreage and a home. After Aunt Michie was told she was to marry Mikizo, she was, to say the least, not very happy. I guess that is a slight understatement if I say so myself. She argued – pleaded – with my Grandfather that she didn’t want to marry him and that she was not raised to be a farmer…but to no avail. Aunt Michie was given away in marriage. Done deal. They wed in 1933. She was nineteen years old. I am glad to see your story continue Koji! The video was ….difficult to watch. Your family’s story is rich and I look forward to continuing learning from you and your ancestors. After all I’ve seen (at the museum), family stories, meeting survivors and reports from historians, I felt this the overall video was objective and pretty accurate… not that I was there, of course. I would start a new one with all your former posts concerning WWII and Japan. This one is fine but you have so many subjects that it is difficult to navigate sometimes for someone who is not used to blogs. Thank you, Pierre! I will give that consideration! An outstanding view of the event and results afterward; we always need to look at all sides to the story. Thank you, Koji, great work!! Thank you, gpcox. Coming from you, it is an extra treat. In THE RED KIMONO, Mama returns to Hiroshima (after the bombing and after her release from Rohwer Relocation Center,) to find her parents. This blog post helps me to see what life might have been like for Sachi’s grandparents during and after the bombing. Often, we don’t stop to look at all sides, or to consider how an event affected everyone–not just ourselves. It’s easy to accept what we learned from our history books as the ONLY truth, and without question. Thank you, Koji, for your poignant post which shows the history of Hiroshima from a different perspective. Wow what a story. I can’t imagine the blast, nor can I imagine being married off. I cannot either…but both happened to many lives over there. Thank you, Curt. That is the overall hope – that someone will read these stories and come to the same opinion. This was amazing! I have never before seen a re-enactment of the bombing of Hiroshima that really gave me a feeling of the blast itself. We’ve all seen pictures, but this was quite a realistic portrayal. I so appreciate how you share the stories of your family’s experience in Hiroshima. You provide the reality behind the history. It’s incredibly hard for me to think about the innocent people who suffered and died in this way and I hope there never is another day when any country will use a bomb of mass destruction. I grieve with you that your family suffered. How amazing that they survived such a blast, but I do wonder what came next for them! I’m looking forward to Part 2. Thanks for taking the time to read the story, Debra. But if you put the bomb aside, America and Britain left Dresden nothing but smoldering ruins. Germans suffered as well as the Japanese on all fronts. In either case, elected leadership failed leaving the civilians to that the brunt of war. The video is but a short clip of a larger documentary; it was based on extensive interviews and historical documents. Frankly, it was miracle the bomb even detonated let alone at the right altitude. Thanks again! And did you enjoy the downpour? Very moving account looking at the horrific events from the other side of the button. The video is a great attempt to show the power of what was unleashed that day. Thank you, animalcouriers, from taking time from your busy day to read and comment. It is interesting to add, given your love for pets, that for days after the explosion, noises from animals like dogs and birds were gone. That must have been extremely eerie. The video was difficult to watch especially now since I can put faces and names to the people who where there. You would think we would have learned from that destruction but man is still determine to destroy at any cost. We should honor all of those at Hiroshima and Nagasaki by destroying all nuclear weapons. Your stories speak volumes for the innocents whose voices were silenced on that day. Now that I can see I will look for part 2. You have so much to say, I still say you should write a book – your words would touch many lives.